Students who are going to appear for the APECET Exam 2019 need to know the exam syllabus before you start preparing for Engineering Entrance exam. If you don’t know the proper syllabus, then you can’t make a perfect preparation plan. Students of different streams can apply for the APECET exam. So, there would be heavy competition among the applicants. We have provided the syllabus for various departments such as Mechanical, Electrical, Electronics, Computer Science, etc. All the students can easily Download APECET Syllabus by using the link provided below. Students must prepare well to get a seat in well-reputed college. Candidates must also know the exam pattern along with the ECET Exam Syllabus. The complete Andhra Pradesh ECET Exam Pattern is provided on this page. You can download Engineering Entrance Exam Syllabus pdf and exam pattern in this article. Name of Organization Jawahar Lal Nehru Technological University, Ananthapuram. Level of Exam State Level Entrance Exam. Application Registration Starts From 18th Feb 2019. Last date for Application Submission 27th March 2019. APECET exam is conducted by JNTU Anantapur (JNTUA) on behalf of Andhra Pradesh State Council of Higher Education (APSCHE). Full form for APECET is Andhra Pradesh Engineering Common Entrance test. This exam is conducted to get admissions in various Professional courses. All students in AP who are planning to study Btech/ Engineering can apply for AP state ECET exam. As ECET is a common entrance exam for all the students who have completed Diploma/B.Sc (Maths)/ Pharmacy streams. All students can utilize the latest syllabus of AP ECET exam to get the top rank in AP Engineering Entrance Exam 2019. You can check our website to know more details of APECET Exam Notification 2019 like Exam Date, Admit cards, APECET Counselling dates, etc. Andhra Pradesh ECET Syllabus 2019 is provided below for the guidance of the candidates. Students can check AP state ECET Exam Pattern here. Exam pattern of various streams in APECET is given below for the guidance of the applied candidates. The exam pattern APECET is categorized in three streams as mentioned below. B.Sc. Mathematics APESET Exam pattern. Mathematics, Physics, Chemistry Subjects are common for all branches in ECET exam pattern for Engineering. There will Separate Question paper for each branch i.e., the Engineering Subject. Maximum marks for APECET exam is 200. Andhra Pradesh ECET Syllabus 2019 is provided below for better preparation of students. 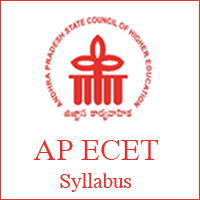 ECET Syllabus 2019 in AP for different streams is given here. ECET Diploma Syllabus consists of Mathematics, Physics & Chemistry. Steam Boilers, Nozzlers, and Turbines. Pharmaceutics, Pharmaceutical Chemistry, Pharmacognosy & Pharmacology are the subjects for Pharmacy AP ECET 2019. Good thought but who will rectifies our prblm ……..??? It s a waste of time so prepare as possible as u can ………..
Once notification released and there is nothing to do. Just create some time in ur day for preparation thats it. Sir, where is the syllabus for Electronics and Communication Engineering.please give reply to my email. In my view, If lesson wise weightage marks are added for every subject,it will be more useful to students. Anyhow this is the best site I have seen, that supply the ecet syllabus in a ideal way. Thanking u sir.and also the plz give me how much marks to subjects plz sir. Book list for preparing ecet as per c16 syllabus for maths, physics, chemistry and mechanical branch subjects,please. SIR I AM C 16 ECE FINAL YEAR STUDENT. I HAVE SEARCHED FOR ECET 2019 SYLLABUS. THERE IS CHAPETR WISE MARKS WEIGHTAGE FOR EVERY SUBJECT . BUT WE ARE C 16 CIRCULUM BATCH AND WE DONT HAVE SAME SUBJECTS AS C 14. BUT THE WEIGHTAGE FOR ECECT 2019 IS BASED ON C 14 SYLLABUIS. PLEASE CHECK THAT SIR. SOME SUBJECTS ARE ADDED AND REMOVED IN C 16 CIRCULUM. PLEASE UPLOAD CORRECT WEIGHTAGE AND SYLLABUS FOR ECET 2019. IT MUST BE BASED ON C 16 CIRCULUM. PLEASE LOOK AT THIS ISSUE SIR.